Kelan Martin is a 6-6 215 small forward with good offensive skills and he's a very hard worker. A leader of the great Butler basketball program, which has been underappreciated for years. Butler has done a great job of grooming some of the best talent in the NCAA and Kelan Martin continues the legacy. Martin averaged 16 points 5.8 rebounds while shooting 34.8 percent from 3 and 78 percent from the line and coming up big in big games. He is "on the bubble" in the NBA Draft Room 2018 mock draft and he's the no. 56 rated player on nbadraft.net 2018 board. Martin would be a valuable contributor to any NBA team. Watch for him to break out even more this season at Butler. LJ: Butler stays in it. What makes Butler basketball so competitive? Kelan: Butler basketball is always overlooked and underrated every year. I feel like every year we get overlooked during the preseason and there is always a chip on our shoulder, so after the first few games we play in big time tournaments during thanksgiving break and they're big time teams in those tournaments. We will play those teams and beat them then there is the media saying, "oh Butler basketball beats so and so by using the butler way", which we have good players that can match up with any team in the country. That's why we are always going so deep in the NCAA tourney. LJ: What is the strength of your game? Kelan: Strength to my game is my ability to knock down the mid range shot, I think that is something that separates my game from others. Also I can create my own shot, knock down the three, rebound, find open teammates and being able to get to the basket whenever I want and defending 3 positions. LJ: Your toughest task as a player playing for Butler. How did you handle it? Kelan: When coach brought me off the bench towards the end of my junior year. I was going through a slump and couldn't manage to get out of it, so coach Holtmann started bringing me off the bench as the 6th man and once he did that my confidence started to rise again, I was kind of down on myself during that time but I managed to be positive about the situation and regain my composure. LJ: What was your best game last season numbers wise? Kelan: My best game last season is probably when we played Villanova I had 22 7 2. The other one was Middle Tennessee State were I had 19 6 4. There were other games that I did really well as well. Kelan: Some NBA players games I watch that I like and try to model myself after is Paul George, Demarr Derozen, Devin Booker, and Kawhi Leonard. LJ: What was your toughest game last season and how did you play? Kelan: Toughest game of the season is when we played at Creighton. We lost by 16 and I was 3/14 from the field and was very frustrated with myself. LJ: What part of your game has improved this season that we will see? Kelan: My ball-handling, my shot and my ability to play with pace and not being so rushed up with things while making my moves. My footwork is a huge part of my improvement to my game. 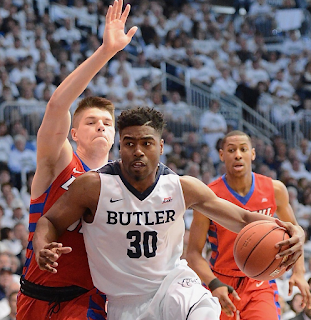 LJ: What can we expect from Butler this season? Kelan: The same thing people expect from us every year, being underdogs that have the ability to compete with any team in the country. LJ: What do you bring to an NBA team on and off the court? Kelan: I can bring multiple things to an NBA team. First I can bring a guy who comes from a great family, has high character, personality, someone who is willing to work each and every day. I can bring a person who cares and is passionate about the game and others. A great locker room guy and on the court I can bring a motor. Someone who plays hard every game, rebounding, defending no matter who it is, knocking down open shots and winning is all that matters to me.